While the health and wellness trend has propelled a cluster of new drinks towards the front of the convenience store fridge in recent years, carbonated beverages have fought hard to retain their market share. According to Convenience Measures Australia, Carbonated Soft Drinks (CSDs) still represent 26% of all ready-to-drink baskets, with cola representing 73% of those sales. The secret to the category’s ongoing success has been its willingness to evolve, and it will have to continue to do so as it faces up to further challenges. The growing numbers of reduced sugar and no sugar variants being introduced are a good example of the proactive way manufacturers have reacted to issues such as mounting concern over sugar content. This proactive approach has seen the carbonated beverages category experience growth in convenience and is +2.8% vs LY (IRI Market Edge Grocery, Value Sales- Australia Convenience, MAT June 2018). Carbonated beverages giant, Coca-Cola Amatil, says it has been delighted to see the total petrol and convenience market enjoy carbonated soft drink growth this year. “This drive to evolve continues to gather momentum, underlined by the performance of these reduced sugar options and smaller pack sizes,” Mr Burton said. A number of Coca-Cola Amatil’s major cola variants now contain less sugar and these include Diet Coca-Cola, Coca-Cola with Stevia, Coke No Sugar, and the soon-to-be-phased out Coca-Cola Zero. Coke No Sugar arrived in Australia just over a year ago supported by a huge sampling campaign, and has gone on to have a strong sales impact. 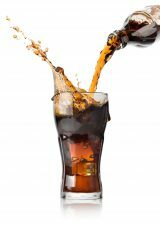 Indeed, while there is a lot of noise being created in the industry around the importance of diet soft drinks and other beverages, sales results indicate there is still a place for full sugar beverages. Industry sources say these still represent the majority of the value share for the market, with full sugar cola, for example, representing 61.6% of the value in total cola. Other core categories are lemon, orange, and lemonade in which full sugar variants are even more prevalent. New research from global market intelligence agency, Mintel, said ‘low/no/reduced sugar’ is a claim carried by 12% of carbonated soft drink product launches in Australia in the two years to October 2017. This is just below the global average of 15% of carbonated soft drink introductions launched globally in the same time period. “Our research indicates that there is a definite opportunity for players in the carbonated soft drink industry to introduce more low, no or reduced sugar offerings into the Australian market,” said Jenny Zegler, Global Food & Drink Analyst at Mintel. The arrival of more sugar free products may to some extent insulate carbonated beverages from the full impact of a future sugar tax, should such a thing ever arrive in this country. Countries such as Mexico, South Africa, France and Norway blazed the sugar tax trail and others have followed suit, including the UK and Ireland earlier this year. With so many different ways that the tax was implemented in the various countries, building up an overall picture of its likely effect in Australia – if it were ever to happen – is difficult. From an Australian convenience store perspective, the key issue is for operators to get their ranging right, to display products well, and to make the most of any noise surrounding the introduction of new flavours, variants, packaging or products. Convenience consumers are generally time poor, so clear and logical planograms that group carbonated beverages by category, brand or size will assist in their decision making process or entice them to make an impulse purchase. Specialised Petrol and Convenience Buying and Retail Development Group, United Convenience Buyers (UCB), says it is constantly following trends that impact beverage choice and consumption. These considerations may include everything from who the consumer is and how it plans its assortment, through to how it merchandises in-store for attractiveness and ease of activation. Carbonated beverages are a perfect fit with the convenience channel as they lend themselves to being ideal to consume ‘on the go’, and are a great accompaniment to lunchtime and snacking occasions, with cola also over-indexing as an afternoon ‘pick me up’. Carbonated soft drinks tend to sell strongly after 10am once the morning coffee rush is over. Considering that consumers are usually picking up a grab and go packaged beverage for immediate consumption, industry sources say the price points in most C-Stores are not so inflated that consumers don’t see the value as compared to the supermarkets. All leading manufacturers recognise the importance of the channel as a place to encourage customers to trial new product, and flavour rotations are becoming increasingly common. Pepsi has also enjoyed great success with its flavour variations. The company says that with more consumers looking for products that offer choice within the convenience channel, there will be a continued focus on a range of pack formats and sizes. It says these will include cans for immediate consumption, as well as bottles that can be resealed. In order to capitalise on the impulse purchase opportunity, operators should ensure a good range of carbonated beverage options are ranged in the refrigerator near the point of sale. It has long been established that bundling beverages with food is another effective way to gain incremental sales, and to encourage product trial by persuading consumers to purchase. Convenience Measures Australia says 30% of shoppers who buy carbonated soft drink, purchase due to promotional offers. It also says cola is the number one ready-to-drink product purchased by shoppers who are purchasing food on the go. With convenience’s greater emphasis on food, the opportunity to grow carbonated beverage sales on the back of food’s success in the channel is obvious. The most recent State of the Industry report from the Australasian Association of Convenience Stores revealed that the On the Go Food category showed an impressive 13.3% growth over the course of the year. Snacks such as potato chips also have a strong purchase correlation with carbonated beverages. Convenience retailers can utilise this strength by having availability of both products next to each other to drive this basket-building opportunity (Source: Shopper Tracker 2017). Two for one promotions are another great way to drive trial of new products and also to lift sales of established best-sellers, although not all convenience consumers are necessarily after two beverages. Convenience and impulse operators then have a huge part to play as they seek to maximise the potential of this reliable and proven category. With leading manufacturers also demonstrating they are ready, willing and able to innovate, carbonated beverages are continuing to prove themselves to be highly resilient. In recent years, sports drinks, energy drinks, bottled water, iced tea, and flavoured milk have all emerged as powerhouse competition in the C-Store fridge, yet carbonated beverages have managed to remain a sales juggernaut in their own right. And they are likely to remain so for many, many years to come. * Convenience and Impulse Retailing would like to thank Coca-Cola Amatil, Pepsi, Asahi Schweppes, United Convenience Buyers, Convenience Measures Australia, and Mintel for supplying information for this article.